Click Here for More Inspirational Photos--Huge jpg file--please be patient. Burn Fat, Increase Energy, and Reduce Water Retention with Nutritional Supplements! Nutritional Supplements Work! You must first learn which nutrients are effective and which supplements fit your individual needs. Do you want to lose weight? Increase Energy? Reduce Water Retention? Well then, I am going to tell you which nutrients you will need to look for when you are trying to reach your weight loss and fitness goals. Here is a breakdown of nutrients to look for when you set specific goals: Burn Fat Nutrients: There are certain nutrients that act as catalysts to speed up fat loss and weight loss. These nutrients enable the body to Burn Fat at a much faster rate providing you are initiating the fat burning process by exercising and/or eating properly. The most important nutrients to look for when losing fat are Choline, Inositol, and CitriMax. You will be amazed at the progress that you will make when you include these simple Fat Burning Nutrients. 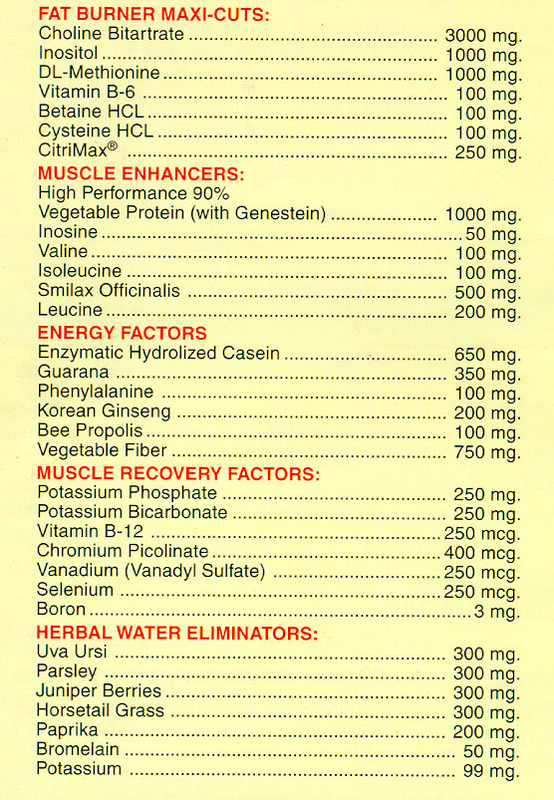 Muscle Enhancer Nutrients: It is very important that we do not lose muscle when we are losing weight. By maintaining the muscle that we have we are able to increase our metabolism to burn more fat as we lose weight. If you lose muscle, your metabolism slows down and you lose fat at a slower rate. To maintain muscle and lose fat faster we must use Branch Chain Amino Acids which we allow us to keep the muscle and lose the fat. The nutrients to look for are Leucine, Isoleucine, and Valine. Smilax Officinalis and Inosine are very effective also. Increase Energy Nutrients: We all need energy! The best nutrients that will supply our body with energy are Ginseng, Bee Propolis, and Guarana. These fine nutrients will give us a sustained energy throughout the day without a stimulant effect that would leave us tired after they wear off. They are safe and very effective for giving us the energy that we need to exercise. Muscle Recovery Nutrients: When we exercise and perspire we lose vital nutrients that we need to help us recover from our workouts. It is important that we replace those nutrients. Chromium Picolinate is an important mineral that has been highly publicized for it's fat burning properties, but I like to include Chromium in the Recovery category because it is an important nutrient to replace after exercise. Other vital nutrients that we need to replace are Potassium, Selenium, and Boron. Reduce Water Retention Nutrients: We all want to get rid of that Bloated Appearance! There are natural herbs that will allow our body to get rid of excess water that is trapped around the hips, waist, buttocks and thighs. Eliminate Cellulite and that puffy, bloated appearance with the herbs Uva Ursi, Juniper Berries, Parsley, and Horsetail Grass. In just a few short days you will fit into your old clothes and notice a thinner and trimmer waistline. When using a water eliminator it is also important to take in a sufficient amount of Potassium. Potassium is a vital mineral that your body needs. When taking a water eliminator always make sure that it also has potassium. You will find all these nutrients in the "BURN FAT...BUILD MUSCLE PACK. This product is what I use to Get in shape and Stay in shape. I have recommended it to all of my clients with incredible results. I can only tell you that if you give it a try you will realize that it works, and very fast. IT HAS A MONEY BACK GUARANTEE. You will see an amazing difference in just the first week. I live on this product because it allows me to feel great, & look great. It also comes with a complete program that I have designed for the person that wants to lean down and get cut or for the person that wants to get huge without putting on unwanted bodyfat. The 2 programs include your Nutritional Program, Workout Program, Shopping List and Recipe Booklet. It is an incredible buy for only $44.95 plus $5.00 s&h. or use the Order Form Here.